How quickly the time passes and you find yourself back in familiar territory wrapped with excitement and joy about the impending Bluesfest. Time dims the memory, takes away the pain and leaves you with a yearning to return. 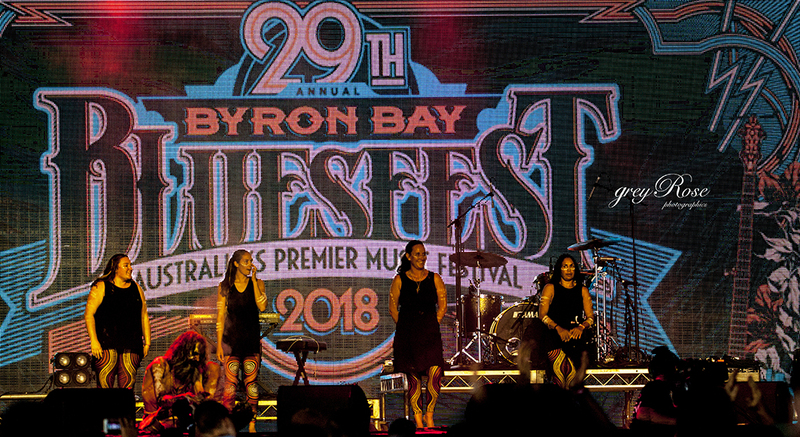 Day 0 – this year began with the semi-finals of the Busking Comp at the Byron Bay Brewery. A lovely mix of beer, good food and some very interesting finalists. The standout that raised the roof with some serious musical talent and crowd appeal was Grim Fawkner. He made it through to the finals and led us into the Official Day 1. After a morning of prep we managed to arrive in time for the Welcome to Country and to catch a few songs from Grim. It was hugs, warm welcomes and the unfamiliar squelching of mud underfoot. We aren’t getting too caught up with the rain as it has been a fair while since the skies were this grey over Bluesfest. We are here, the music is awesome and some extra prep means that we will probably stay dry – relatively – lets say. The crowd was mellow and moving between showers and tents, taking some time out to jump puddles and spash about in between. We began by getting some musical appreciation and listening to Lukas Nelson & Promise of the Real. He got everyone up with his Nashville sounds and blues guitars. Rag ‘n’ Bone Man has a velvet voice that melts you to the core and he gives of a wonderful sense of happiness to be there mixed with awe. Coming into the night the music began to get funky and the New Power Generation really brought on the party. Lively, colourful and energetic they made the tent roof bounce. Then there was Tash Sultana, mixing it up, getting down in the speakers and ridding the crowd of any negative vibes before smashing out her unique style of music. Day 2 is coming down – pretty sure it will be amazing.